I finally found one at an estate sale in the South! 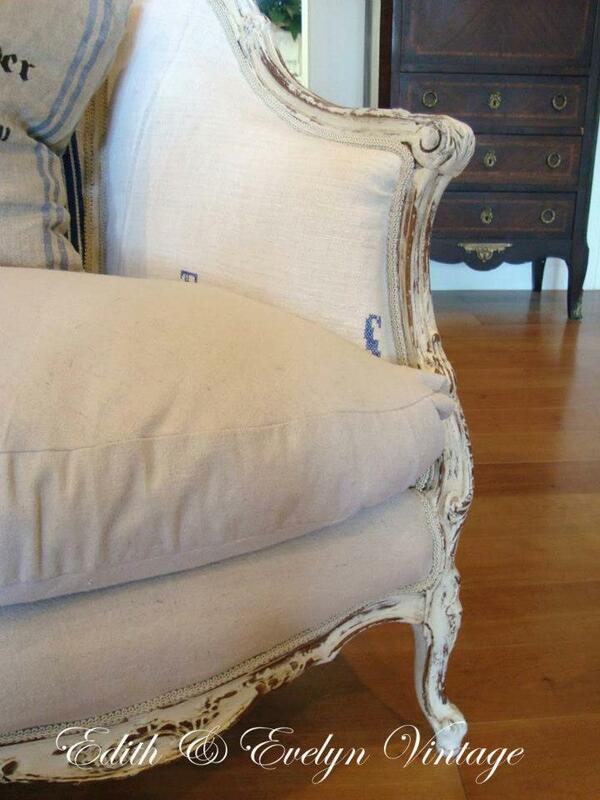 upholstery, she is in excellent condition! She was exactly what I wanted so home she came! and there must have been 10,000 staples! Fortunately, the “stuffing” was still in good condition! 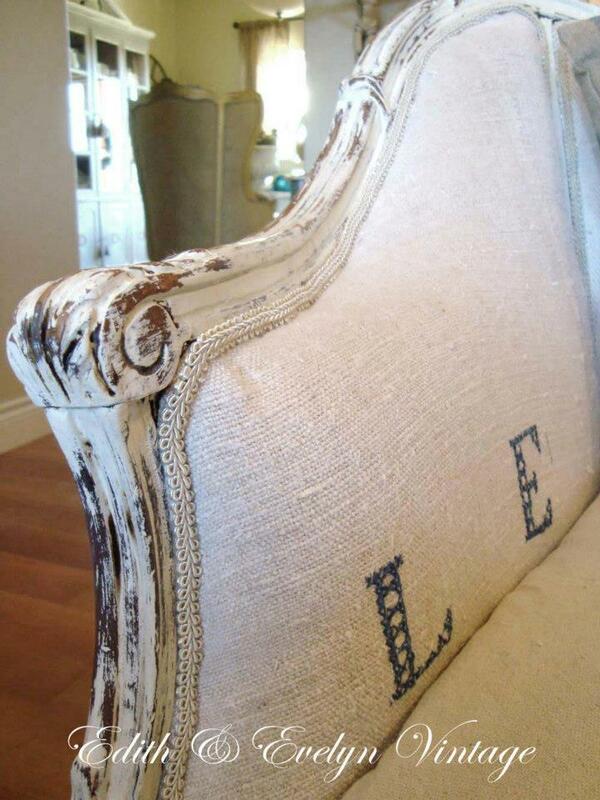 After stripping her of her “clothes”, I painted and distressed with the chalk paint. Then a coat of clear and dark wax, and buffed when dry! Next came the fun part….not really…….but I just kept the vision of the end result in my head! and wash it when it gets dirty (we have two spoiled fur babies). I love finding old European grain sacks with the farmer’s initials monogrammed on it. I actually had two that I had been saving and used both of them on the sofa. may get changed at some point. I’m very pleased with the end result! I don’t know if I want to tackle another upholstery job like this again anytime soon! I love her curvy legs! Even Mr. EP (Essential Person….the hubby) likes it! 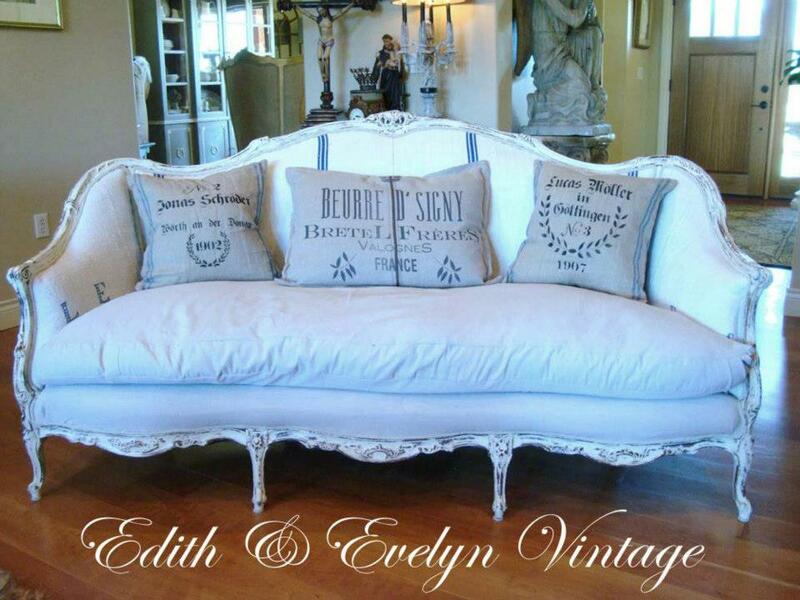 « Who is Edith and Evelyn? Planning to start my project on a very similar loveseat I bought for $25 at a Goodwill! 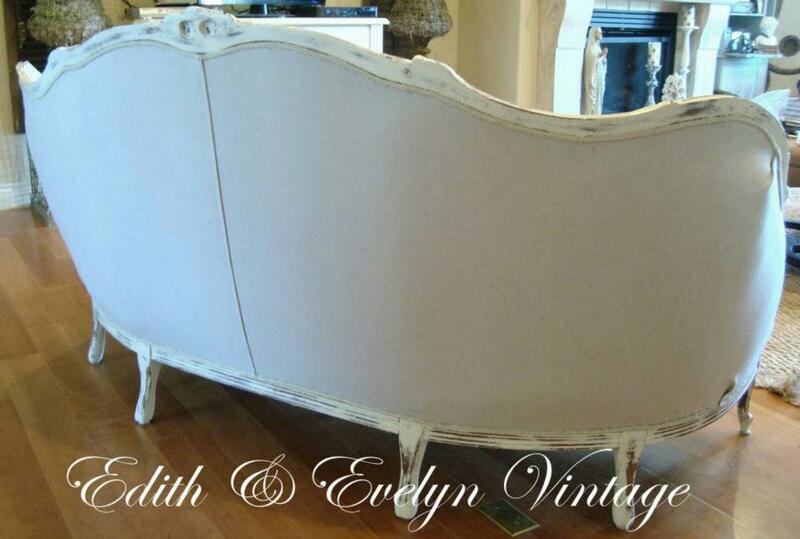 The legs are curvy and beautiful but unpainted dark wood that give a nice contrast to the cream colored linen I chose to cover it. I couldn’t decide whether or not to leave them as is or paint and distress. I think YOUR sofa helped me decide to paint and distress for sure ! Wish me luck ! That sounds beautiful, Jessie! Good luck!! Hello Cindy! 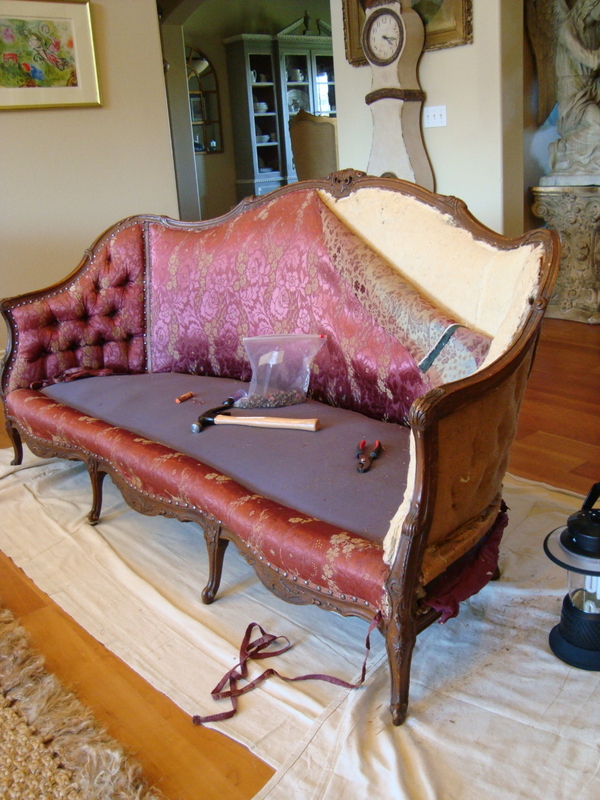 I am FINALLY going to attempt reupholstering my antique couch…I return to your post often to try and find any detailed instructions and clues both through your post and through the comments section. You mentioned that you washed the dropcloth first and added bleach. What temperature of water did you use? How many times did you wash it? Exactly how much bleach did you use? And if you washed it more than once, did you add bleach to EACH wash? And when you dried it, did you dry it in the dryer? When you ironed it, was it completely dry first? And finally, do you think you’ll ever do a detailed tutorial on the couch? I know it’s been years but your website is the best for this style of decor. Ok, thank you and have a great week! Hi Joel! I washed the drop cloth in warm/hot water with laundry detergent, and adding about 4 cups of bleach. I stopped the washer halfway through it’s cycle and let the drop cloth soak for about 3-4 hours, then finished the cycle. I only did the bleach soaking one time, but if you remove it and it still isn’t light enough for you, then repeat the process. Also, make sure you are using a drop cloth that is 100% cotton. It doesn’t work well if it’s a poly blend. I dried the cloth in the dryer on medium setting until dry, then ironed it. I hope this helps! Hi Cindy, I just found your post on Pinterest. I was so excited to see how you recovered the sofa. I bought one just like yours and a chair to match for $100 about 3 years ago. It took me a while to get her recovered but I did it and yes, there were a million staples. Mine had been recovered once before and it smelled of cats so I stripped it to the bare bones. I used Lowe’s painter cloths on the front and burlap on the back. She turned out beautiful. She is a little low to sit on so I thought of making a cushion like you did. I like the way it looks. What were the materials that you used in the seats cushion if you don’t mind me asking? You can take a look at mine at my blog. Thank you for sharing. Hi Jo! Our sofa had a long down cushion and I just made a slipcover for it. It was pretty thin, so I took two king size down filled bed pillows and stuffed them inside the slipcover with the original cushion to give it more fill and depth. Hi Kathryn! I used a pneumatic staple gun to attach the fabric to the frame, and then a glue gun to attach the gimp trim over the raw edges and staples. The seat cushion is made of feathers. I painted the wood frame, and stripped all of the old fabric off of it, and then recovered with the grain sacks and drop cloths. It was a little bit intimidating, but I just took a section at a time and worked on it, using the old fabric for patterns to cut the new pieces. It’s far from perfect, and I’m sure a professional would have done a much better job! Cindy…the sofa is gorgeous! Everything you do is fantastic. I learn so much from your blog. Did you make the pillows that are on the sofa too? Thank you. Thank you, Maureen! Yes, I made the pillows as well. Hi Heather! I used the 10 oz Everbilt drop cloth from Home Depot! 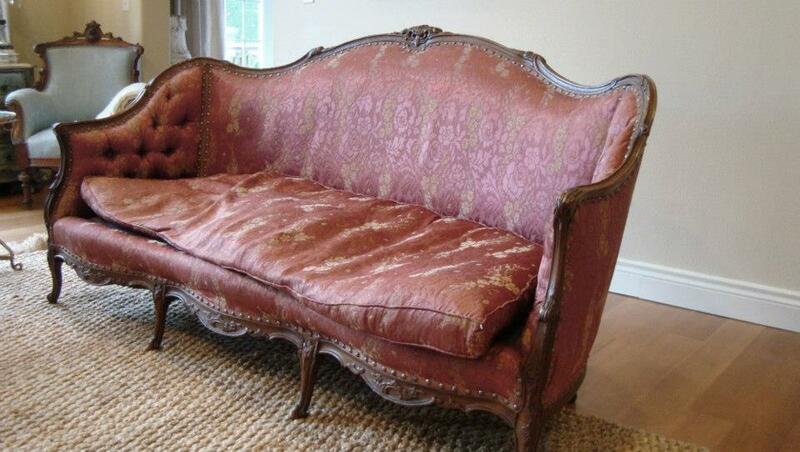 I have a French sofa just like that in my living room in my Victorian home. Mine has a beautiful pink expensive brocade material on it. It had been reupholster when I purchased it. I wouldn’t ever take it off and do it creamy beige. But to each their own. 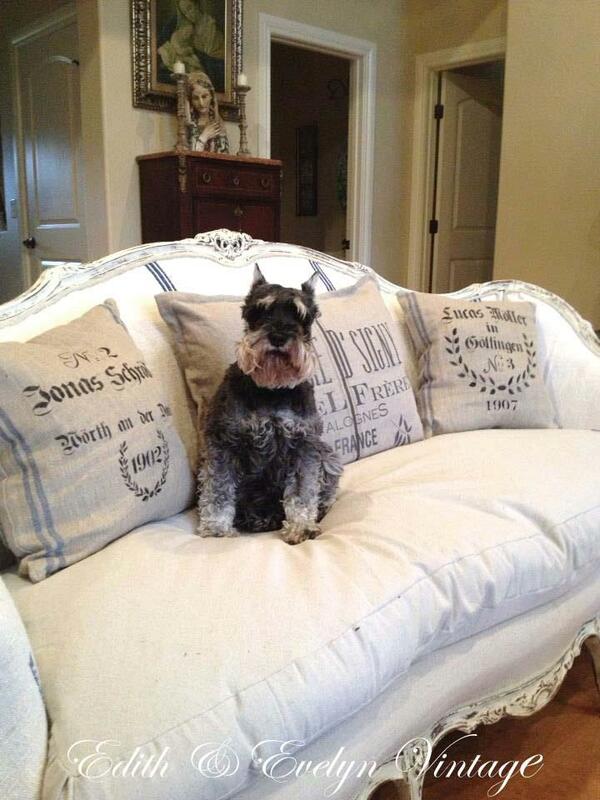 Cindy love what you did – I just finished a french style sofa in the drop cloth fabric….my first time too….would love to get your thoughts on it as well and I have some french nesting tables I would love to paint and need some guidance please email me when you can so we can chat and come up with a plan. I know it’s not polite to stare, but…I have to! 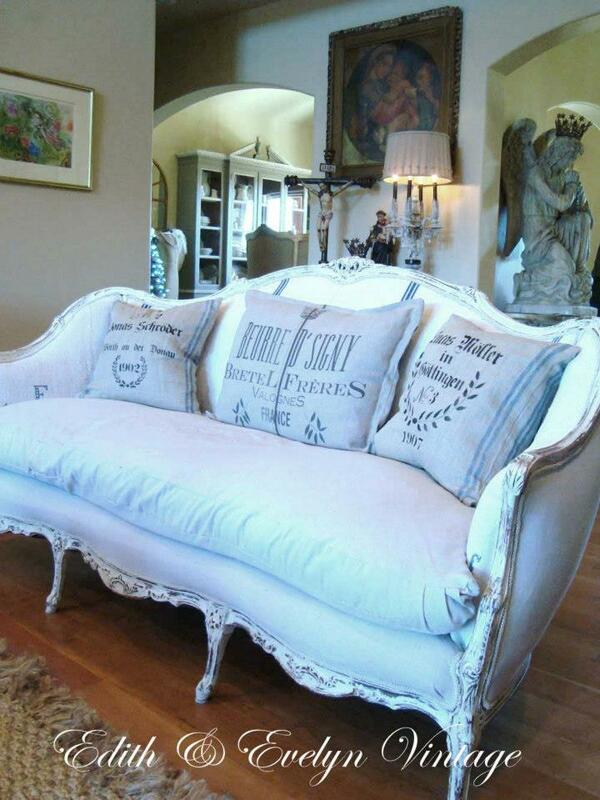 Cindy I know that I am so late to this French sofa redo party but I love EVERYTHING that you did to it! Can you share HOW you did it? 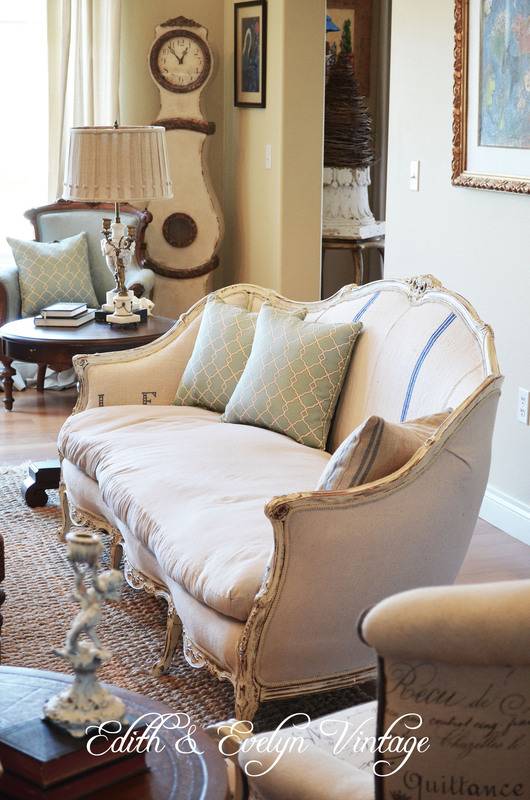 I have read your post on the sofa’s transformation but am curious as to how you applied the dropcloth and trim. Also there is a seam on the back (which I love) and I wondereded how to duplicate that. And finally, how many dropcloths did you use for the base of the couch (not including the cushions)? Ok, thanks! Thank you! The drop cloth is stapled on with a pneumatic staple gun. The trim is applied with a hot glue gun over the raw seams and staples. The grain sacks weren’t large enough without sewing two together, so the seam you see is that. I only used one drop cloth for the base, they are quite large, and come in different sizes. Hope that helps! Thank you so much for responding! Yes, it helps a lot. First of all thank you so much for your blog. It’s fantastic. I’m wanting to use Lowe’s drop clothes for a sofa redo. I’m wondering if they come in different sizes or quality, which do you reccommend. Jealous much… Love this so much! Looked for one at Round top. Found a super beat up one at Round Top. Thought the guy wanted too much for the condition it was in. Wish you could pm me a range of prices that is good and wish I had asked that before I went. Audra, I think I paid like $125 for this one, but prices can be all over the map depending on what part of the country you’re in. I’ve seen some go for ridiculous prices! I’m in love! 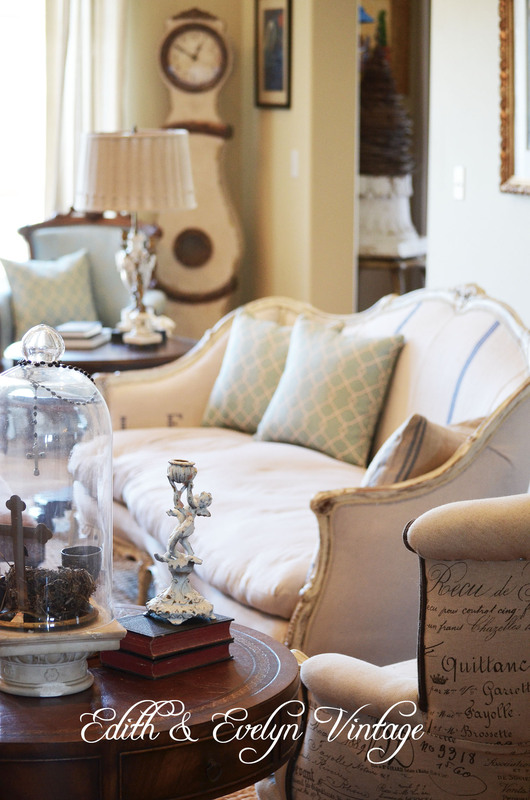 I’m planning to redo a tufted French sectional and am thinking of cotton canvas, the same stuff drop clothes are cut from. Haven’t committed yet because I’m sure if to go with 10 oz or 12 oz or #12 duck. I’m over thinking it I know. Anywho…beautiful job! It looks great! What did you put in the seat cushion? I actually just made a tie on slipcover out of a Lowe’s drop cloth for the original down filled cushion. It isn’t perfect (it was my first attempt at a slipcover!) and at some point I will remake it, but for now it works for me. The slipcover makes it easy to remove and wash and put back on. Oh my Gosh…it is beyond gorgeous! What an unbelievable transformation. Cindy, excellent job! Just brilliant. Don’t know if I’m brave enough for a sofa yet. BTW, as a Catholic, love all the recent religious additions in your etsy shop. Especially the saints.